Donations by check can be made payable to: Aspire, Inc. Aspire has been helping Citrus County to shake it up for over 6 years! It’s been our goal to teach teens to live their life on purpose, to make decisions intentionally. 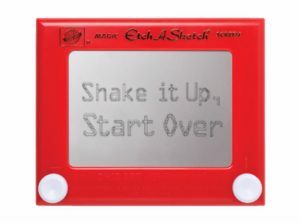 One of the ways we make that message stick is with our mascot, the Etch-A-Sketch. We say that their life is like an Etch-A-Sketch and they can control the turns they make. No matter what mistakes we have made, or how the picture of our lives has turned out, it’s never too late to shake it up and start over with a new slate! In an effort to keep this message alive, it’s our goal to get an Etch-A-Sketch key-chain to every teen in Citrus County. To start with, we are ordering 1200 for the students that complete Aspire’s 8 week high school program (The RIVER Project). The cost associated with this campaign is $7,836 ($6.53 per key chain), but the more we can order the better!